Cherry Hill High School East senior Sammy Miller speaks to the board. He, like many students praised suspended history teacher Tim Locke, and spoke of security issues at the school. The controversy over the suspension of a Cherry Hill High School East history teacher who spoke out about security issues following the school massacre in Parkland, Fla., continued Tuesday with a student walkout, a plea from the town's mayor for the school board to act on security, and a meeting of the board that drew an overflow crowd. 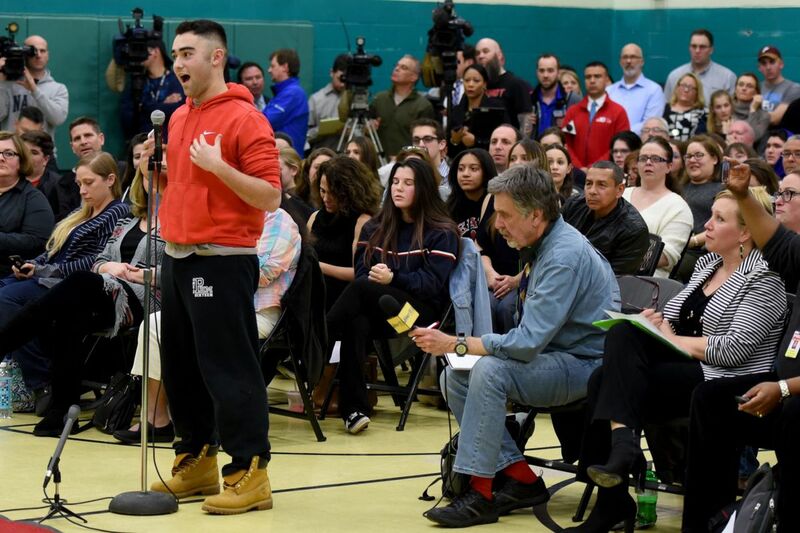 Hundreds of people packed the gymnasium at Cherry Hill Alternative High School on Tuesday night to hear and address concerns about school safety. After waiting for the board to finish its agenda, they began talking about events at Cherry Hill East. The public comment period had not yet begun, but the main topic on people's minds emerged during what otherwise was a routine report on student activities by Lauren Atkin, student representative from East. "The students have decided to fight for their teacher and for their security," Atkin said from her seat next to the board. Students have been held accountable, Atkin told the board, "and now we want to hold you accountable for keeping teachers that truly change lives and shape us into the young adults you want us to be." Students have praised history teacher Timothy Locke as the most inspiring teacher they've ever had. They said the action taken against him was a form of censorship that has cowed other teachers at the school into silence. They also expressed anger at the principal, who they argued has disrespected the students and not been forthcoming about their safety concerns. Board President J. Barry Dickinson said at the outset of the meeting that the board could not address personnel matters or answer questions during the public comment period, but that didn't stop some students from demanding answers and directing their ire at the governing body. One matter was clarified. When a student asserted that the teacher had been suspended without pay, a representative of the board said suspension without pay was not legally allowed. Hours earlier at Cherry Hill East, students walked out about 8 a.m. They were orderly, and some chanted: "Free Locke!" The walkout ended around 9:30 a.m., when students filed into the auditorium, where principal Dennis Perry listened to them in a public-forum setting. Locke, 59, has said he was placed on administrative leave on Thursday after a pupil became upset when Locke discussed the Parkland shooting in his history class and expressed his fear that a similar crime could happen at 2,200-student Cherry Hill East. In an interview Monday, Locke explained his actions: "The bottom line is that I was very concerned about the security at my school." A video posted later Tuesday on a township group Facebook page shows the students at one point asking Perry why he had threatened to suspend student protesters and bar them from attending prom and senior trips. The principal's response, shown in the video, was indirect: "I'll say it again, this right now is a protest where your voice is being heard. A protest where your voice will not be heard is when you are blocking some of the 2,200 students from going to point A to point B — that isn't a protest," Perry said to jeers. By day's end, Perry had retracted his suggestion that students who participated in the protests should not be permitted to attend the senior prom, senior trip or graduation. Instead, he thanked the students for "the respectful manner" of their conduct. His initial reaction, he said in a statement Tuesday afternoon, stemmed from "concern for the safety of all students" after he read an online post urging students to "create as much disruption as possible" at the school. Support for increased security also reached as far as the township hall. Mayor Chuck Cahn and the township council on Tuesday issued a statement calling on the school board to "address and take action on the issue of school security." Police Chief William Monaghan also declared his commitment to school security Tuesday and recommended that the district, in weighing any new security measures, consider using armed police officers. Even as the focus shifted to security measures, students remained upset about Locke's suspension and continued to press for its reversal. The early morning walkout was just one of the efforts by students and parents in support of Locke. A petition on Change.org garnered more than 1,100 signatures in one day. Ryan Munn, a freshman at the high school, said most of the campus organizing had been done by students who had taken classes with Locke, who shared their protest plans via social media. "There was this energy in the school of rebellion that I've never felt before," he said, commenting on the force behind on the protests. "From what I heard in the auditorium, Locke was the only teacher [students] could relate to, the fact that he was suspended made them feel that much more unsafe," he said. According to Munn, most of Cherry Hill East's teachers remained silent on safety and protest issues because they are afraid of being punished by the administration. "One of the biggest complaints when students spoke in the auditorium … was that we don't ever discuss this stuff. After the Parkland shooting they didn't bring up anything," he said. "We think that can't happen to us because we're East." Barbara Wilson, a spokeswoman for the Cherry Hill School District, said she could not comment on personnel matters. Several students and parents reached out to the Inquirer and Daily News in support of Locke, who began teaching at the school in 2001. Superintendent Joseph Meloche told parents at a meeting Monday night that he could not comment on Locke, said Scott Seligman, a parent of two children who attend Cherry Hill East. "The bigger problem is the school is missing the point — the school failed to recognize the huge link between Cherry Hill and Parkland. A lot of kids knew each other through night camp," Seligman said. "A lot of the children have videos on their phones of the shooting and massacre within the school. It's burned into their memories. They come back into their school, and they don't feel safe." Cherry Hill East does not have armed security or metal detectors, he added. In an interview Tuesday night, East seniors Amanda Seligman and Lilly Checkoff said they never felt unsafe in Locke's classroom. "God forbid anything ever happened, I feel like he's the only teacher who would even know what to do," Seligman said. She said she was disappointed that he was suspended from the high school because he was one of the only teachers who ever made an effort to connect with his students. "I feel like it's his job as an educator to teach us about what's going on in the real world," she said. "We're upset this was the result of him talking about something that happened." The school board began Tuesday night's meeting with the Pledge of Allegiance and then a moment of silence for the victims and survivors of the Parkland shooting. Several students said that was the first time that had happened in the Cherry Hill district and said student activism was the reason why. Before the school board meeting, Cherry Hill parent Beth Taubman (right) and others pause for a moment of silence for the victims of the Parkland school shooting.